D.	The man of sin (second beast, false prophet) deceives the wicked into making an image of the beast (Rev 13:14). i. He gives life to the image of the beast, gives it the ability to talk, and compels the world to worship the image (Rev 13:15). ii. If this image of the beast is taken literally, then modern technology could easily be used to make it speak. E.	The man of sin (second beast, false prophet) causes all of the reprobate to receive the mark of the beast (Rev 13:16). i. Facts about the mark of the beast. a. It is received in the right hand or in the forehead (Rev 13:16). b. It is necessary to buy or sell (Rev 13:17). c.	It is associated with the name of the beast and the number of his name (Rev 13:17). d.	We are exhorted to count the number of the beast (Rev 13:18). e.	It is the number of a man (Rev 13:18). f.	The number is 666 (Rev 13:18). ii. My best guess at what the mark of the beast is. a. Seven is the number of completeness -- God rested on the seventh day when He finished His work (Gen 2:1-2). b. Six is the number of incompleteness and imperfection of man's works (it is the number of man - Rev 13:18). (i)	It is repeated three times to signify that man has been a total failure. (ii)	Thus, the number of the beast represents man's works. c.	The reprobate trust in their works for salvation (Mat 7:22-23). (i)	Works-based religion could therefore be the mark of the beast. (ii)	All those who trust in their works have the mark and will all go to hell (Rev 14:9-11 c/w Rev 20:11-15). d.	The beast's religion could likely be humanism. (i)	Those who don't conform to the religion of humanism with its atheistic, feminist, sodomitical, and egalitarian doctrines, who will not worship the government system (the beast) that promotes and enforces them, and therefore do not have the mark, will be cut off from commerce and killed (Rev 13:15-17). (ii)	Those who refuse to go along with the system will stick out like a sore thumb or a big stamp on one's forehead, and everyone will be able to see that they don't have the mark. (iii)	This is already happening. (iv)	People have lost their jobs and had their careers ruined for speaking out against it. (v)	I was cut off from using AirBnb because I would not sign their wicked policy regarding sodomites and transgenders. (vi)	There could very well come a time when most corporations, banks, payment companies like PayPal, etc. will enact policies which will make people consent to the humanistic beast system, or be cut off from commerce and not be able to buy or sell. F.	At this point, it looks like Satan has almost won the war. 17. Satan closes in on the saints of God and just as he is ready to destroy them, Jesus Christ returns and destroys him. A. When Satan was loosed, he went out to deceive the nations and gather them together for the final battle against Jesus Christ (Rev 20:7-8). B. Just as Satan and his forces have the camp of the saints compassed, fire from God comes down the destroys them (Rev 20:9). C.	Jesus Christ destroys Satan and the man of sin with the brightness of His coming (2Th 2:8-9). D.	Satan lost the last battle with God. 18. Satan is cast into the lake of fire and the war is finally over. A. God had prepared the lake of fire for the devil and his angels (Mat 25:41) awaiting the last day. B. The devil is cast into the lake of fire to be tormented day and night forever and ever (Rev 20:10). 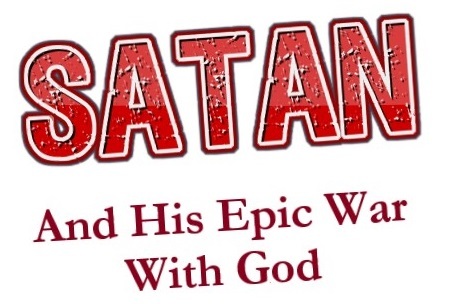 C.	The war between God and Satan is finished. 19. When will the final battle in the epic war be fought? A. It will be fought at the second coming of Jesus Christ (Rev 20:7-10 c/w 2Th 1:7-9 c/w 2Th 2:8-9). B. When is the second coming of Jesus Christ? i. It is on the last day when Christ returns to resurrect the dead (Joh 6:39,40,44,54; Joh 11:24). ii. On the last day of time, both the righteous and the wicked will be resurrected (Act 24:15; Joh 5:28-29). iii. The resurrection of all men will happen at the same time that the heavens are destroyed (Job 14:12-15). C.	When is the last day when Christ returns? ii. People have been trying to predict the date of Jesus' return for nearly 2000 years and they have all failed and will continue to do so. iii. Even if a man gets lucky and gets the date right, it will be by chance, not by wisdom and knowledge. iv. Jesus plainly stated that no man knows the day and hour of His return (Mat 24:42-44; Mar 13:32-35). a.	Jesus Himself in His humanity didn't even know the date of His return (Mar 13:32). b. How presumptuous is it for a man to claim to know something that Jesus didn't know! v.	Some try to avoid the plain statements of Jesus by not setting a specific day, but rather by choosing a day as an outer limit before which Jesus will return. a. There are a couple of problems with this. b.	Firstly, the Bible says that not only don't we know the day or the hour, but also the times and the seasons of Christ's return (1Th 5:1-2). (i)	Season n. - II. gen. A time, period, occasion. 12. a. A particular time or period during which something happens, or which is defined by some characteristic feature or circumstance. (ii)	Therefore, no man knows the time or period of time when Christ will return. (iii)	If you think that we can know the time period or season of Christ's return, then please tell me with confidence and authority when specifically that period takes place or when we are in it. (iv)	If you can't do so, then you don't know the times or the seasons of Christ's return. c.	Secondly, if we make it to the day before the outer limit, then we know the day of Christ's return. (i)	For instance, let's say that someone does some calculations and concludes that Jesus will return no later than December 31st, 2050. (ii)	They will justify their unbiblical prediction by saying that they are not setting the day of Christ's return, but just the outer limit. (iii)	But what if time goes on until December 30th, 2050? 1. If the man is right, then we know the day of Christ's return, and Jesus is a false prophet. 2. If the man is wrong and Christ doesn't come on December 31st, 2050, then the man is a false prophet. 3. Date setting is therefore dangerous business. vi. Some will not explicitly set a date for Christ's return, but they teach that the saints will be resurrected and raptured at a specific time before the return of Christ (usually 3.5 or 7 years). a. This, too, is date setting. b. If this teaching is true, then when the saints are resurrected, everyone will know that the return of Christ is exactly 3.5 or 7 years away.